Combine the Artist 20’s smooth tremolo with an independent variable 0-10 dB clean gain boost, and what do you get? An effects pedal with attitude! When I reviewed Hamstead Soundworks’ Artist 20+RT combo in SOS November 2015 I gave high praise to the sound of its solid-state analogue tremolo. Unlike the bias-modulating tube circuitry in my vintage Deluxe Reverb, the Artist 20’s tremolo produced a beautifully smooth cycle with no extraneous noise. Fast-forward a few months, and designer Peter Hamstead has had the novel idea of combining the Artist 20’s tremolo with an independent variable 0-10 dB clean gain boost, to produce that which I’m tempted to describe as an effects pedal with a little bit of an attitude. In addition to the Artist 20+RT tremolo’s ‘Signature’ sound, the Hamstead pedal can be switched to a ‘Classic’ mode, mimicking the harder-edged lumpiness of a vintage amp’s tremolo section. Controls and switching for both Tremolo and Boost functions are simple and intuitive, although personally I would like to see some scale marking around the knobs. Being too power-hungry to run off a 9V battery, the Signature pedal requires an external 9-18 V DC power supply that’s capable of supplying at least 300mA of current — this must be purchased separately if you don’t already possess one. An internal DIP switch gives you the option of running the Signature in either true-bypass or buffered modes. Despite the fact that, in true bypass, all the pedal’s active circuitry is out of circuit, I could hear no tonal difference between the two, the only real difference being that there is no switching noise to be heard when in the buffered mode. Since that mode is the one you’d be using if the Signature was driving other pedals down the line and there’s no sonic penalty, I’d tend to leave it there. Having made your choice, in operation the tremolo’s Signature setting sounds exactly as I remember it from the Artist 20+RT — smooth and musical across the entire frequency range. Classic mode sounds to me more old-school and somewhat rougher-edged in comparison but is, nevertheless, more than capable of putting sounds from the ’60s and the early ’70s at your disposal. A goodly amount of clean gain is always useful, not only to drive the input of a valve amplifier that bit harder, but also to beef up single-coil pickups. Placing a boost pedal in an amplifier’s effects loop, rather than over-pushing its preamp into distortion, is often well worth trying if you want a bit more level. With the Signature pedal, you can use the boost with or without the tremolo (or the other way around) so, if you insert it into a non-tremolo amp’s effects loop, you can add both tremolo and boost post preamp — especially if you have another boost pedal that you can put in front of the amp. 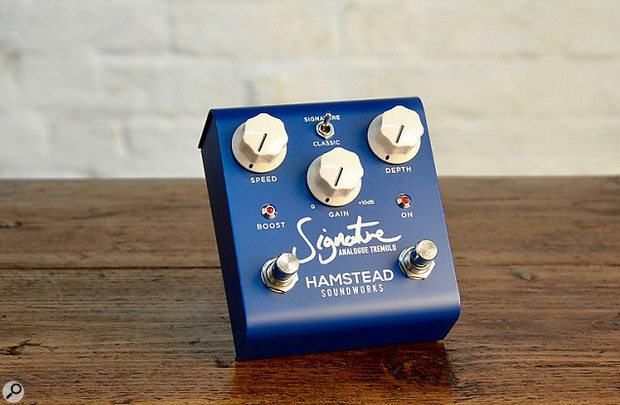 The Hamstead Soundworks Signature Analogue Tremolo pedal, like the company’s amps, is superbly engineered and sounds wonderful. There are quite a few competitors with similar products, both analogue and digital, sitting around the same price point but, from what I can see, the Signature’s particular combination of tremolo and independent clean boost seems to be unique. I could perhaps quibble about the absence of an included power supply, but in reality I can’t think of a reason why anyone in search of a great-sounding high-end tremolo pedal would not consider buying a Hamstead Signature. If you’re looking for a tremolo, you should try out a Signature — you’ll like what you hear!